Most of us don’t realize how dependent we are on electricity until a storm or accident suddenly takes it out. Our work, our entertainment, the comfort of our homes, even the safety of our food all depend on a steady flow of electrical power. But providing that power can take a heavy toll on the environment. In recent years, that has led to increased interest in renewable energy, which focuses on making the process more efficient and minimizing its effect on the environment. It’s a big responsibility, and doing it well requires all kinds of people with different skills and talents. 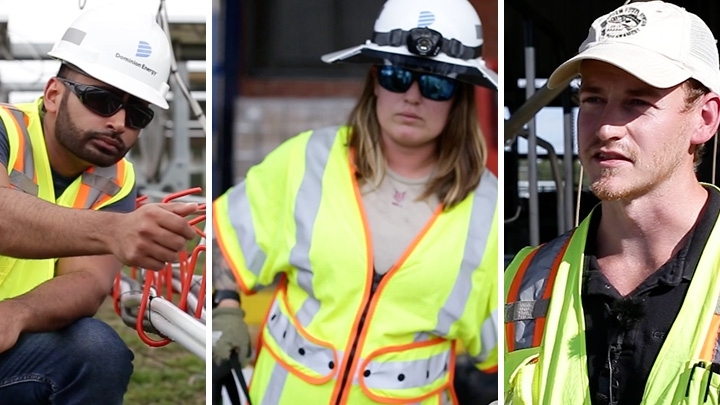 Let’s meet three Dominion Energy employees who are doing very different jobs to bring power safely to our communities. Armaan Sakhrani is a Project Engineer at one of Dominion Energy’s solar farms, where huge panels are used to capture the energy from sunlight and direct it into the supply we all use. Noelle Young is a Groundman, a job also known as a Line Worker Helper. Her job includes an array of coordination and support tasks at the ground level. Her work helps to keep the repairs and maintenance running smoothly so that the energy supply is as efficient as possible. Danny Bryant is a Biologist, whose focus is on how energy affects the wildlife where it is harnessed and transmitted. Project engineers design, build, maintain and supervise complex systems, which might be anything from a manufacturing plant to a construction site. They make sure that all parts of the system are functioning as they should and solve problems that might arise. In renewable energy, a project engineer might oversee the function of a solar farm, as you saw in the video, or manage the operation of a system of wind turbines. Depending on the industry employing them, project engineers might be trained in mechanical engineering, civil engineering or even aerospace engineering. What does a Line Worker Helper do? They have a support role, assisting licensed line workers in the installation, repair and maintenance of systems that deliver electricity to our homes and businesses. They work at the ground level, making sure the Linemen have what they need to get the job done and assisting with ground-level logistics like traffic control. Many Line Worker Helpers are working their way up to become Licensed Line Workers; collectively, they may be referred to as Line Installers and Repairers. Biologists study living things, which means they can be put to work in a variety of settings: research universities, national parks, zoos and laboratories, just to name a few. Biologists who work in renewable energy are focused on how our collection and distribution of energy affects the wildlife around us. They might study the fish near a hydropower station or examine how wind turbines are affecting the behavior of nearby bats and birds. With this information, they can recommend adjustments and actions to lessen the impact on animal life. The Bureau of Labor Statistics has lots of great information on careers in biology. What are the job prospects in this field? Nationally, in a 10-year span there are expected to be almost 300,000 job openings in the energy industry, including everything from machinists to project managers. In Virginia, these jobs offer a median annual income of more than $65,000. What classes should I take to help prepare for a career in renewable energy? Jobs in this field cover a variety of STEM subjects. Classes in earth science, biology, engineering and physics would all be helpful to pursue a career in renewable energy. In order to address the growing need for qualified candidates to fill these jobs in the future, the Virginia Department of Education has introduced coursework geared toward an Energy Industry Fundamentals (EIF) certificate in its Career and Technical Education STEM cluster. Some Virginia community colleges also offer a Career Studies Certificate (CSC) in Energy Technology, and are working toward offering this as a dual enrollment option so that high school students can earn the CSC before graduating. How can I learn more about working in this industry? The Center for Energy Workforce Development has a website called “Get Into Energy” that gives an overview of the opportunities in this field. Check out the area especially for young students, which outlines educational goals as well as scholarship and contest opportunities. The Virginia Energy Workforce Consortium website features “How to Get into the Virginia Energy Industry,” a helpful summary of the jobs available and the educational career pathways to get you there. PBS NOVA Labs has a great website called Energy Labs, where you can watch videos, play games and meet experts to help you understand the complex systems that deliver power to your homes and devices.